It’s Trip Tuesday at Camp Campanelli and today we’re featuring a popular destination: Clifton Hill in Niagara Falls, Ontario. Have you heard of this renowned road? It’s basically like the famous Vegas Strip but, this one is for families. On this one street (Clifton Hill) you can walk from the gorgeous Niagara water falls up through an entertaining array of rides, restaurants, shops, arcades, mini-golf and so much more. It’s all there for you on that one street. If you’re doing ‘summer on a budget,’ and you’re within driving distance from Niagara Falls (Canada), this is a great day trip that feels like you’ve traveled somewhere magical, without the cost of flights and hotel. We like to leave our home early in the morning and get there as the tourists are rolling out of bed. We’ve always managed to park right on the main street too because we aim to arrive for 9:00/9:30 am and most visitors are at breakfast. This is an obvious destination for couples (on dates) or for those with older kids because of all of the haunted houses, wax museums and historical components. But, is this a great place to visit if your children are aged 5 and under? You bet! 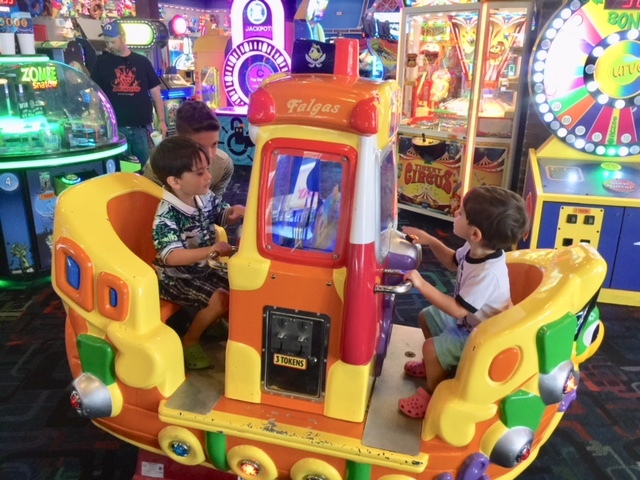 This is a popular first stop for us and almost every family that sent us a message on Instagram agreed – kids love those games that spit out tickets for prizes (especially toddlers). Our three boys (aged 2 yrs, 4 yrs and 13 yrs) could have stayed and played all day. There’s a ton to see and do within the big midway space (including a haunted ride, which our boys were too scared to go on). We spent $20 on tokens and they lasted about 30 minutes. The little rides inside the Midway are perfect for toddlers (there are a bunch of options) and it’s a nice break from the heat or cold in the Midway, depending on when you’re visiting the strip. 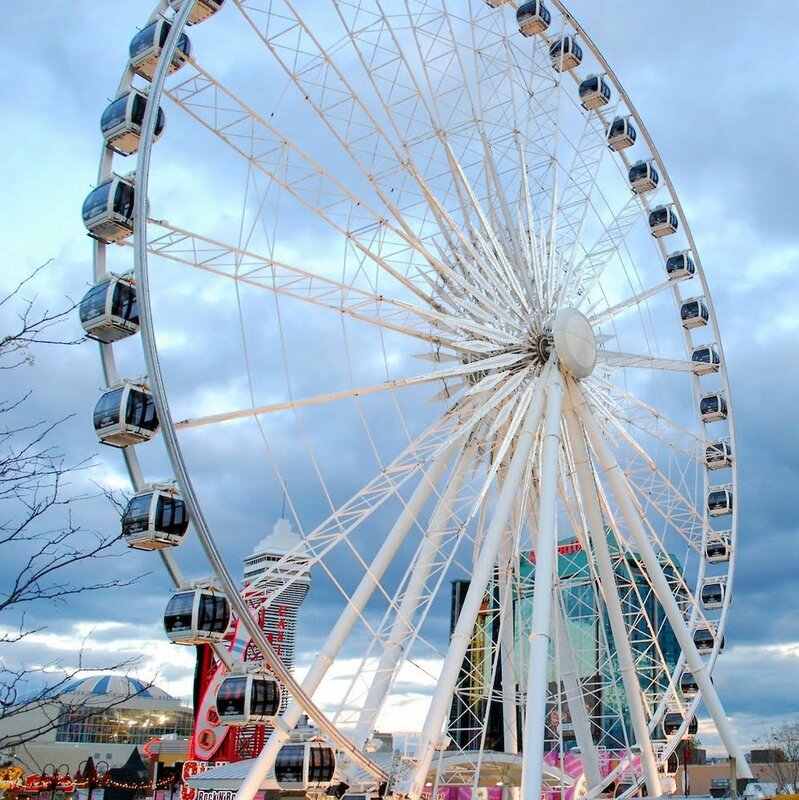 Canada’s largest giant wheel ride provides views of the area like you’ve never seen before. On our first rotation we all scrambled around the pod like hamsters in a wheel trying to see the views from all of the windows, but the ride lasts a lot longer than we thought (we went around 5 times) so you’re able to see the city and the falls from incredible angles. It’s a safe enclosure and young kids love looking down at the dinosaur miniature golf area. If you’re lucky enough, you’ll see the volcano erupt while you’re passing by in your pod. If your kids like playing with dinosaurs and/or balls, this attraction is for you. Even if they’re too young to mini golf, the Dinosaur Adventure Golf is still a fun experience. Little ones can try rolling the golf balls or teaming up with an adult family member to complete the course. There’s so much to see and do within the Dino area (including the volcano eruption) that little kids get a kick out of it. Some of the dinosaurs roar and growl and it’s all very life-like. While the older kids enjoy three acres of water park, the wave pool and large water slides, your littlest ones can enjoy some play time too. There’s a smaller Splash area for younger kids (aged 2 and under play free) which is great for toddlers and pre-schoolers. The park totally caters to young families offer access for strollers (right inside the waterpark area), a place to warm up bottles and FREE swim diapers of various sizes at the guest services area. This is a great day-outing (you can even have lunch poolside) that you can access from the large parkade behind the water park. It’s the big water slide attraction visible from most angles in Niagara Falls (within the FallsView Casino complex). For adventurous toddlers (which is pretty much all of them) the Journey Behind the Falls, which is near the base of Clifton Hill, is a great option. Instead of having to corral your kids on the busy, bustling boat rides (which are also fun but a lot more trying with a two year old), take them on a foot-path type adventure through caves…that take you behind the falls. It’s a great way to burn off energy and let them explore the natural environment. Again, it’s a great break from the heat too if you’re visiting Niagara Falls on a sunny day. Just remember to bring comfortable shoes for everyone. Don’t let the name deceive you. It’s called a Speedway, but it’s quite safe for kids. In fact, we saw little toddlers ride the track when paired up with an adult. The cars travel at various speeds (Noah’s went faster than Rick’s although neither of them went that fast) so you don’t have to worry about wild crashes on the track. Neither our 4-year-old nor two-year-old were tall enough to go on the attraction (have to be over 40 inches in height) but Noah and Rick rode around. You get quite a few laps around the track and there’s a playful excitement about it all. If family members are waiting behind, there’s a smaller, shaded arcade area right near the entrance as well as some tasty food truck type options. 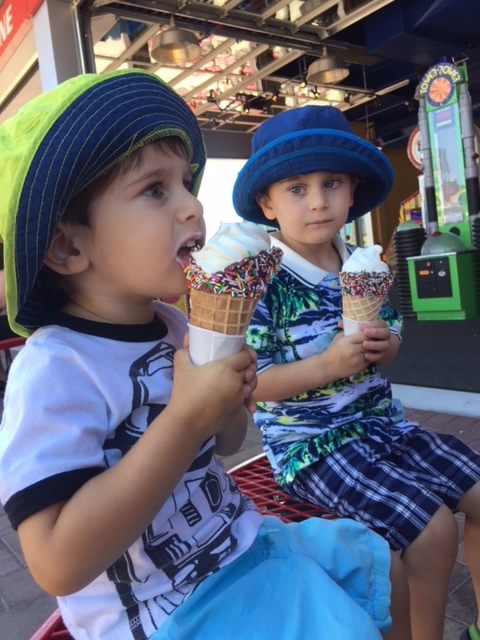 Our littles feasted on delicious ice cream cones while we watched everyone race around the track. (7) Check out the Clifton Hill Fun Pass before buying individual tickets. If you plan on making a day (or multi-day vacation out of your time on Clifton Hill, we recommend the Fun Pass. 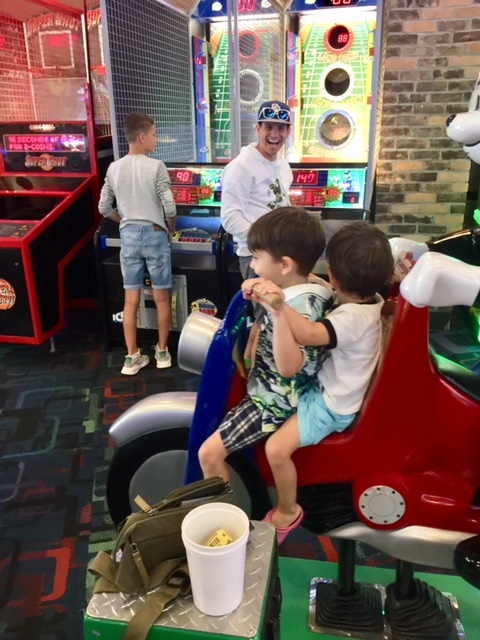 If you plan on trying out these 6 attractions (some were too mature for our little guys) it’s definitely worth the savings. A lot of parents in our community messaged us saying that it’s totally worth it. Even if you go down there thinking you’ll just pay for the few things you want to do, most of the time you end up doing it all because it’s just that tempting! If you’re taking toddlers with you, we’d recommend avoiding the Zombie Attack, the Ghost Blasters Dark Ride (it’s a bit scary) and the haunted houses. There are play lands on the Hill (a toddler playland and a fun house that are much better options for young children. As soon as you arrive on the Hill, it’s always good to walk to strip to plan out your route. Every family is different so you never know what will appeal to your children. The first time we took our two little guys, the street was so loud and full of big noises (from the exploding volcano and growling exhibits) that they were too scared to get out of their stroller and walk. This time around though (which was about 3 months later) they walked the entire time. There’s something to do on Clifton Hill both day and night. You can spend as much as you want or do things on more of a budget. A lot of people bring food and snacks and have each child choose an activity or two. 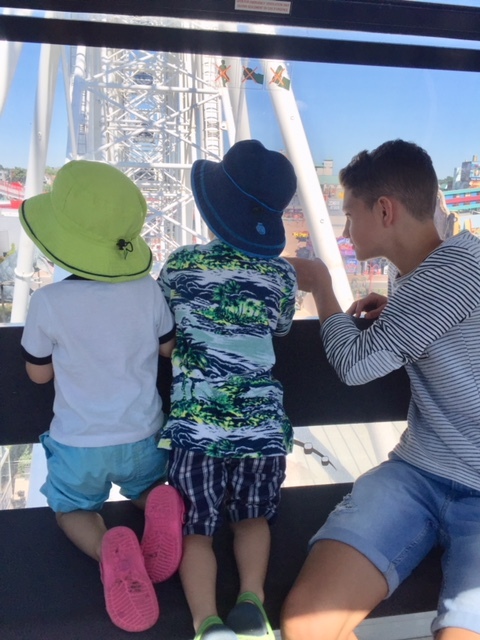 Anyone you do it, Clifton Hill is a great little entertainment destination for travelling families!